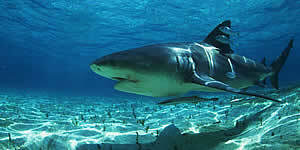 Sharks are fish that appeared in the oceans nearly 350 million years ago, and have hardly changed at all. There are more than 350 species and only a few of them are a thereat for man. The lemon shark is a typical fish of the coral reef waters, buy the gray and bull sharks can be found in most areas of the ocean. Sharks play an important role in the ocean's ecosystem regulating the fish population. They feed on the sick, old or wounded fish, that are not the best for reproduction. This way, only the healthy and strong ones survive having vigorous descendants that ensure the survival of the species. The nurse shark swims close to the bottom and sometimes they remain completely still. They feed on crustaceous and mollusks that live on the ocean floor. They are harmless, allthough they can defend themselves quickly with a keen sense of what is going on around them. Thanks to this, it has been possible to train them at the Oceanarium Rosario Islands, getting them to behave in a atypical manner, such as getting on the platform completely out of the water and establishing a realtionship with their trainer, who can hand feed and caress them. They have successfully reproduced at the Oceanarium Rosario Islands.